Not only am I a 23 year educator (wow...has it been that long? ), I am a mother of 3 young (energetic) boys. My sons, although adorable loving and gifted in their own ways, each struggle in school...and each in a different way. All 3 boys are on IEPs to help accommodate their needs and support their learning success. My oldest son has ADHD. Focusing, organizing, and comprehension can be a challenge at times. My second son has cerebral palsy. He has a whole team of specialists in and outside of the school setting to help support him physically, academically and socially. As far as the youngest...well the verdict is still out on him. So...what does my background have to do with teaching...everything! My eyes have opened and I finally "get it". My boys have not only shaped me into being a mother who advocates for them but their challenges have really changed who I have become as an educator in the classroom. I have great understanding now of challenges that students have. Helping ALL kids is on my radar all day... every day. I recently attended a low tech assistive technology conference and found some easy inexpensive tools that I can bring into my classroom to help and support my students for success. So let's start out with "What is Assistive Technology (AT)"? AT is something that is used to increase a student's capabilities, participation and independence in the classroom. Assistive Technology can be a range of things...electronic spelling dictionaries, weighted vest, lap pads, slant boards, iPads, fidgets, adaptive paper and the list goes on. When my son with CP was struggling to keep up with writing his work because of his left-sided weakness, he received an iPad from our AT Department. An iPad because of its cost would be considered high tech but this was my first experience hearing about the possibilities of assistive technology. I love them! My boys love them! My students love them! I have tons of them...no joke. When I see a student picking at their fingers or tapping loudly to stimulate themselves, I hand them a bucket of fidgets to choose one from. 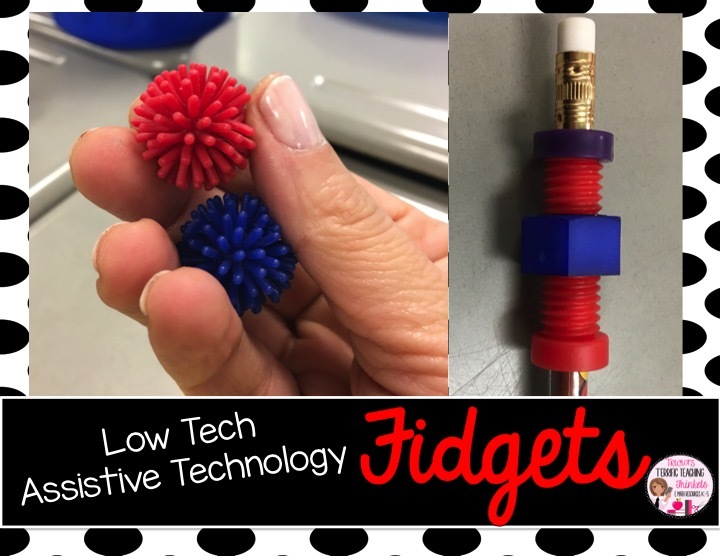 The fidgets seem to help my students with calming and focus. My fidgets come in all shapes, sizes, textures and colors. I believe that movement (even in small amounts), kinesthetic learning and sensory input are very important for many learners' success. A Quiet Kit can be full of anything! This one in the picture has putty, fidgets, mini plastic puzzle pieces (love these...remind me of Legos which my boys adore), bendy animals and sensory balls. This concept was something new for me. I love organizing and putting things in darling containers but although obvious, I haven't thought of putting together a small tub of sensory kinesthetic tools. Brilliant! 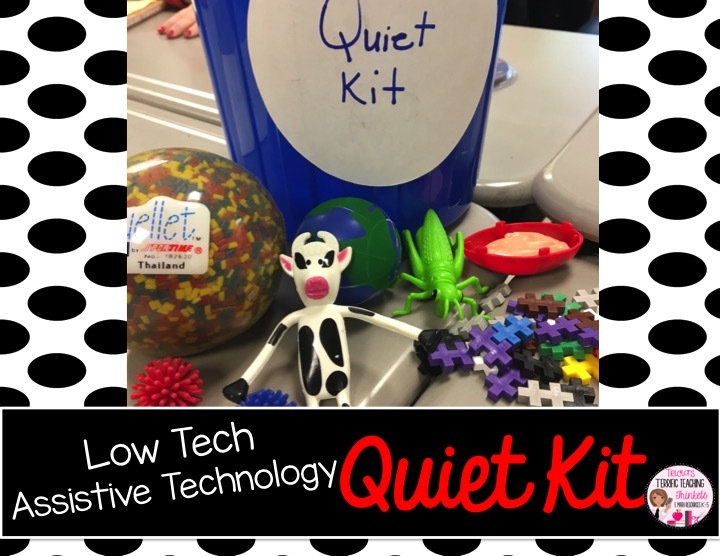 A student is having difficulty focusing on your lesson....no worries... go sit at the Quiet Kit desk and fidget while you listen. Thumbs up for this trick! There are tons of different types of scissors. 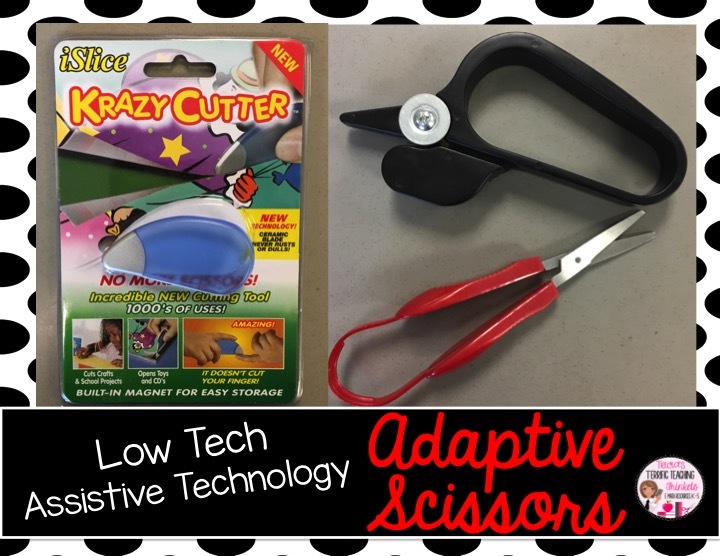 Left handed scissors , right handed scissors, scissors that slide, scissors with different grips, scissors with magnets and scissors with springs. Here are a few that we have used in classroom. 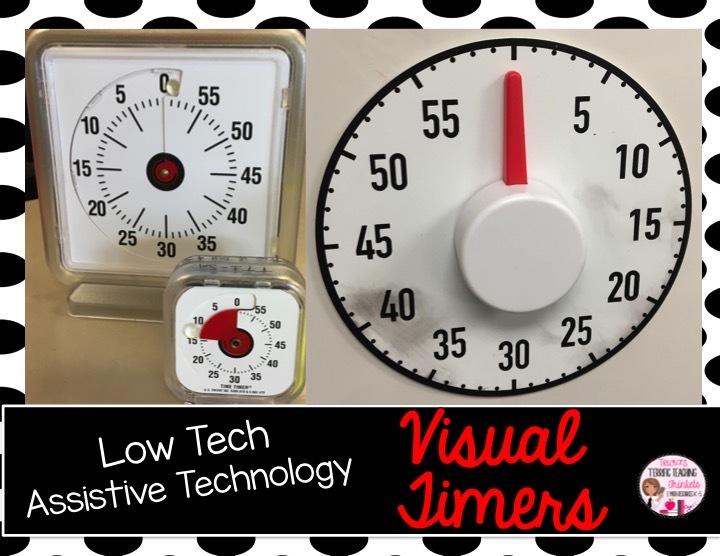 I have used hour glasses and Time Timers but the timer on the right side is my favorite. It is magnetic and is perfect on a white board! I love bumpy seats. The red bumpy seat to the left is the typical one we have in our school. 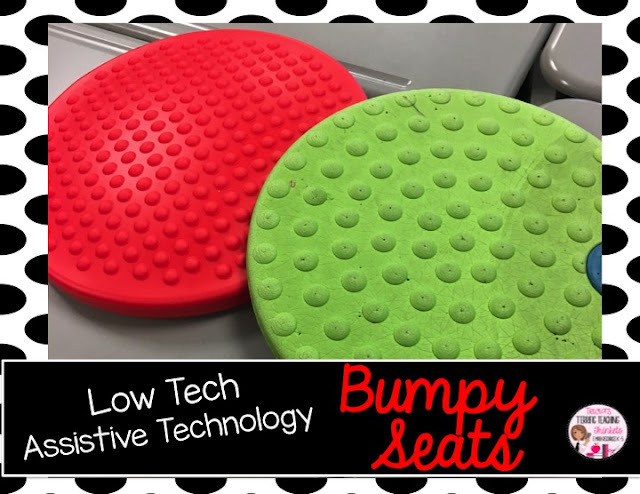 The green bumpy seat is actually one that was purchased at IKEA. It is more of a foam cushion rather than the typical inflated ones but definitely a cost saver. So where can you purchase Low Tech AT tools at a reasonable price? I love incorporating low tech AT in my classroom. I think it can be very helpful for some students. What special things do you use in the classroom or at home to help kids? I'd like to share a high-tech tool that helps partially sighted people "read" on their own. With this discreet camera attachment students with visual impairments can achieve greater independence without depending on others.